That Brian Njoroge is now an active 4 year old is remarkable. When his mother brought him to a health center at age 1, he was listless. He didn’t smile. He didn’t interact with others. The center discovered that Brian had a developmental delay and was malnourished. But with the center’s care, Brian has come a long way. He’s now dressing himself and loves to play with other children. Thanks to a group of dedicated sisters, Brian’s mom and dad got help early. 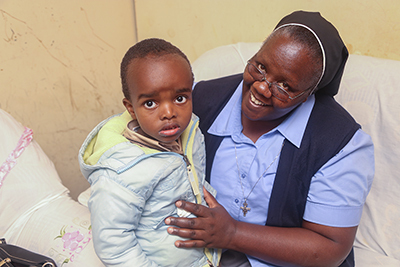 With support from the Conrad N. Hilton Foundation, Catholic Relief Services works through national associations of sister congregations in Kenya, Malawi and Zambia to improve early childhood development, or ECD. When the sisters met Brian, he was at a pivotal point in his development. Children up to age 5 are developing fast physically, mentally and emotionally. It’s a critical time when parents may require help understanding the individual needs of their children, especially if a child is diagnosed with a disability. Through a project called SCORE-ECD, which stands for Strengthening the Capacity of Women Religious in Early Childhood Development, the sisters help families understand the importance of nutrition and feeding, and communicating early and effectively with their children. Sister Pauline says the sisters have influenced early childhood development policy in the countries where they work. “We have been changing attitudes, and helping children grow holistically,” Sister Pauline says. The sisters work in 48 congregations, many of which struggle with malnutrition. A balanced diet is critical to a child’s development. It can also be challenging for families to get children with delays to eat enough, even when the food is available. The sisters show families how to grow healthy food for their children. In some cases, they provide home feeding services on weekends and monthly health checks for children. The program also reaches those in the margins—children with disabilities and those with HIV and AIDS. 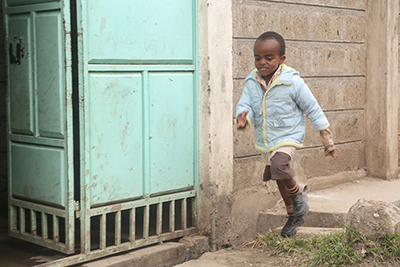 In some communities, children with disabilities are shunned. Some parents go so far as to hide their child under a bed when visitors drop in. The sisters work with families to make sure children with disabilities receive the help they need through home and health center visits, and outreach programs. “We want them to feel welcomed and loved, while participating with other children,” says Sister Pauline. Brian has received that love and support, and he is thriving. When he started the program, Brian received weekly nutritional supplements to help him grow. He did exercises to assist with his coordination, and used colored blocks to stimulate his brain and gross motor skill development. Brian is not alone. More than 3,000 children have benefited from SCORE since it began in 2014. The success of the program depends on building on experience and passing on what is learned. Eighty-five sisters in Kenya, Malawi and Zambia have become master trainers in early childhood development. They in turn have trained more than 1,300 sisters in child protection, nutrition, early childhood development, financial management and resource mobilization. And those additional sisters have helped more than 2,600 caregivers learn the importance of early intervention. The biggest winners are the children themselves. Learn more about CRS’ approach to early childhood development.